Directions: From Boulder take either Broadway Street or Hwy 36 north out of Boulder. Just after you leave North Boulder, make a right onto Longhorn Road and follow this to the trailhead and parking area. Boulder Valley Ranch is a popular open space park just east of Hwy 36. The trails are mostly flat but climb some rolling hills. 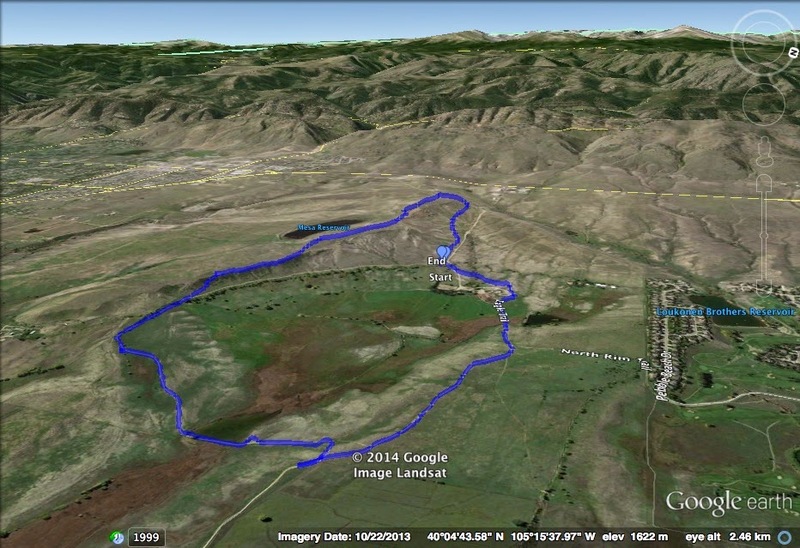 There are great views of the Boulder Foothills and some scenic ponds along the way. Avoid hiking here in March however as it becomes a mud pit. The main loop starts by leaving the parking area, heading east, on the Sage Trail, when you reach the junction with the Eagle Trail, turn right and start heading back to the southwest. You'll pass BVR Pond 1, which has some nice views looking back towards Boulder. When you reach the junction with the Sage Trail, you can either turn right and head back to the trailhead, or continue on the Eagle Trail for another 1.2 miles along a ridge to the Cobalt Trail. When you reach the Cobalt Trail, descend the ridge and cut back east for just under a mile back to the trailhead. There are many options here to make a longer hike if you so wish, but this main loop makes for a very pleasant, if not crowded or muddy, hike along the plains northeast of Boulder.